So, we got a little carried away and ended up with a stove ten times bigger than we planned. 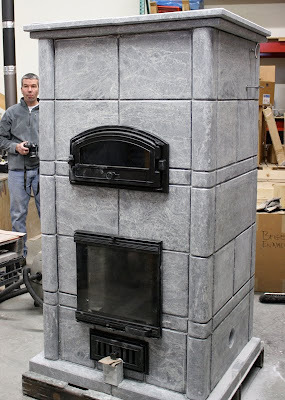 Just kidding... but this slide show is the first glimpse of our new stealth project, a soapstone masonry heater, which we just built in concert with our soapstone supplier. Masonry heaters work on the same principle as our other stoves, which use the thermal mass of the stone to absorb and radiate heat slowly. A masonry heater has serpentine flame and exhaust paths throughout the large stove body, so eventually the whole stone structure is warmed. A morning and evening fire can heat an entire home. We built our masonry heater on a welded steel pallet so we have the ability to move it in and out of our test booth, and we can't wait to get this monster going. We expect to start selling and installing masonry heaters this spring along with the other new stove we've been promising, which is also coming along quite nicely!